Reach the trailhead by going west about seven miles from Woodland Hills on Mulholland Highway to Stunt Road. Turn left and go one mile, parking off the pavement on the right. Cross Stunt Road and start the hike on a dirt road. Hike up the fireroad to the north. This is steep and rocky giving us an excuse to stop and look around. Cold Creek has its source up the canyon to the south. The porous sandstone stores water from the winter rains, supplying several perpetual springs with clear water. The 530-acre Murphy Ranch which includes the springs and the upper part of Cold Creek was presented to the Nature Conservancy by Kathleen Murphy. The year-round stream turns west near where we parked and enters Malibu Creek downstream from Tapia Park. Continue uphill on the fireroad. 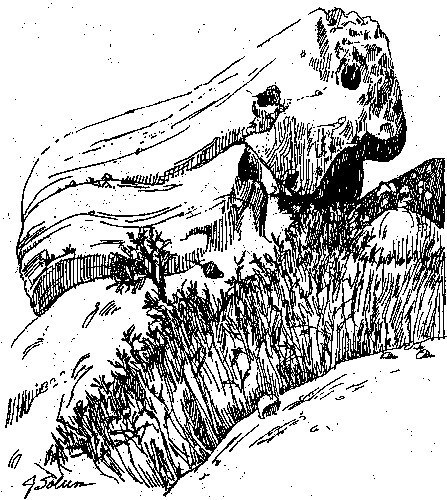 Large slabs of sandstone were tilted on edge when the Santa Monica Mountains were being formed and have weathered to grotesque slanted outcroppings. Upon reaching the saddle we are on "Fossil Ridge." 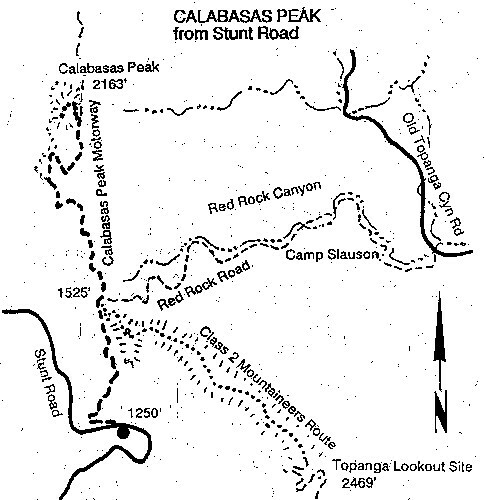 The road to the right drops down through Red Rock Canyon to Old Topanga Road. On a day when we want to add 3 or 4 miles to the hike, we can go down into Red Rock Canyon as far as the road, then turn around to climb back. On this segment the loss and gain is 350 feet. Now back to the ridge. Stay on the Calabasas Peak Motorway as it continues the climb. We notice "Marmot Rock" on our left. Several years ago graffiti was sprayed on the "Rock" but the effects are wearing off. Nearby we can find dozens of Santa Susana Tarweed. This plant is on the endangered species list, and although it grows in other parts of the Santa Monica Mountains, it has found a home here in sandstone cracks. The seldom seen Silver Lotus grows along the road but we must be alert to spot the few plants here. Look west to find the profile of "Lady Face Mountain" on the horizon, about 10 miles away. Calabasas Motorway continues to climb and steepens some as it makes a switchback to the right. We make a sweeping left turn going around the south-facing slope of the mountain and head north. Upon reaching a temporary high point the road takes a slight dip as it heads for a saddle. Here we leave the road by getting onto a trail set back from the road cut. We will climb up a bulldozer-eroded rocky slope to turn left and follow the ridge to the top. Look around for a "sign-in" book if you would like to let others know your feelings about the climb. Return by the same route. We will have hiked four miles.